What is Brachycephaly and How is it Treated? Brachycephaly is a condition characterised by a flattened area at the back of the skull. Most parents notice their baby’s brachycephalic head shape when their baby is around eight weeks of age, with their baby’s head appearing wider than expected and their ears sometimes being pushed outwards. A brachycephalic head shape can also involve a slight bulging on the forehead and a wide brow. For babies with brachycephaly, the head is also often higher at the back and the whole back of the head can appear completely flat with the absence of any rounding towards the neck. Brachycephaly is a form of flat head syndrome and can be found either in isolation or in combination with plagiocephaly. 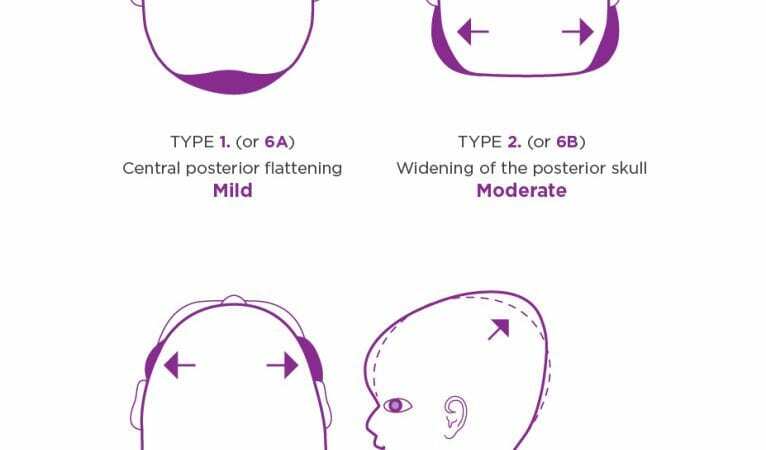 For parents who have recognised a flat area on their baby’s head, it can be confusing to decipher between a brachycephaly and plagiocephaly head shape, but our previous post offers guidance on the difference between plagiocephaly and brachycephaly and how they tie in with flat head syndrome. A brachycephaly head shape develops when the natural growth of a baby’s head meets external pressure, which in turn inhibits growth to that area of the head. During early infancy, a baby’s skull is still soft enough to be moulded by these external pressures, which can lead to areas of the skull becoming misshapen and result in brachycephaly. Pressure during sleep: babies are born with a soft, pliable skull which tends to develop during infancy. A flattening of the skull can occur if your baby has a tendency to sleep in one position each night, therefore applying pressure to the same area of their head. As the flattened area develops, your baby may then become even more accustomed to that particular position, enhancing the flattening further. Or, their head may naturally roll into that position. This cause of brachycephaly is particularly common due to the sleep advice given to parents. This policy advises parents to place their babies on their back to sleep, to help avoid Sudden Infant Death Syndrome (SIDS). Despite its effect on the prevalence of flat head syndrome, we are true advocates of the very successful Back to Sleep campaign and do not recommend that parents stop following this advice; since this fantastic campaign began, the number of babies who have suffered cot death has dramatically reduced. Large head size: some babies simply have larger head sizes than others and the muscles of a very young baby are not able to move the head away from a flattened position. Prenatal and moulding during birth: a baby could be born with a brachycephaly head shape due to positioning in the womb or descent into the birth canal. We often see babies who have been in the back to back position prenatally. Hydramniosis (low amniotic fluid level): when the mother’s amniotic sac doesn’t contain enough fluid, there is also less cushioning in the womb. Additionally, if there are multiple babies in the womb, such as twins, this causes ‘crowding’ in the uterus. This prenatal environment may place excess pressure on the baby’s skull and result in a brachycephalic head shape. Following a professional diagnosis and consultation with one of our clinicians, the brachycephaly treatment we offer will depend on the age of your baby and the severity of the condition. For babies whose brachycephaly head shape is in the ‘mild’ range, and for babies who are still very young, we would recommend implementing repositioning techniques before anything else. However, if these techniques have failed and/or a baby’s head shape is severe, we might recommend our TiMband treatment to treat your baby’s brachycephaly. The helmet works with your baby’s natural skull growth to bring about a permanent correction. This treatment is most effective when started between 4 and 7 months of age, but we can start our brachycephaly treatment up to 14 months of age. As mentioned, repositioning techniques can often help to treat brachycephaly, and ‘tummy time’ gives your baby time during the day to play on their front, encouraging them to try new positions during play time. Read our top tips on how to make tummy time and repositioning easier for your baby. Using toys and mobiles in your baby’s cot doubles up as a source of entertainment and a sleeping aid. However, they can also be utilised to encourage babies to sleep on different areas of their head whist in their cot. Changing the position of your little one’s toys and mobiles can influence your baby to turn their head and relieve pressure to areas of their head. When you feed or carry your baby, try to alternate the side you do so, and, where convenient, introduce a sling instead of a car seat or pram to help keep your baby as mobile as possible. If you suspect that your little one has brachycephaly and would like to find out more information and get a professional diagnosis, call 0330 100 1800. Our friendly and professional clinicians will advise you on the best possible course of action to take for you and your baby.